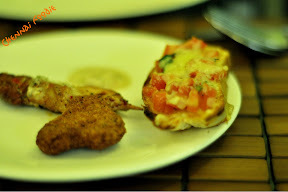 We had three starters - a Greek kebab, cheese bruschetta and crumb fried chicken all of which turned out to be superb. We were going to order one more round of starters, before the wise one stopped us and suggested we finish the main course before trying anything silly. And the main courses arrived as we finished the starters, a chicken a la kieve, which is the picture with the huge cutlet like thing. 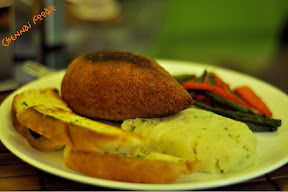 It was a fantastic dish, big breast of chicken stuffed with herbs and dressing and fried to perfection with very little bread crumbs. Slurp. 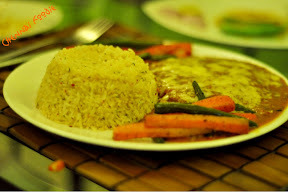 The women ordered a Mexican rice with a chicken dish, starts with M, but cannot recall the full name and Chicken parmigiana. The parmigiana was tasty, but was very different from the usual parmigiana, while M was tender, with a good dose of Mexicany spices and I being someone who kills for good Mexican, loved it. 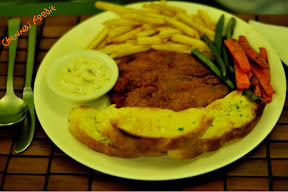 We also had a fried chicken which was very good, but paled in comparison to the other two dishes. 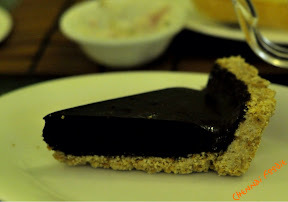 We were stuffed to the throat and thanked the wise one for stopping us for ordering starters, but there is always space for dessert, very small space this time around, so we got ourselves just the one, a mud pie like dessert. Lip smacking it was. That we went to Corner House for death by chocolate and a litchi cream desert is another matter altogether. The ambiance is pretty worn down, it's a small place, and the service is friendly. The whole meal cost us Rs. 1950 and the food was more than worth it. I have no idea if the consistency is there or anything else, but that night, it was food the winner all the way. And yeah, I really miss you Gallopin Goosberry, but I know I can head to Bangalore if I miss you too much. This place is on the road (80 feet road) bang opp Ramaiah Medical College, near Mekhri Circle. There is a Corner House diagonally opposite.